It all started with the Nike East launch of #NewYorkMade – a city-wide campaign celebrating the people, products, moments and stories of NYC. 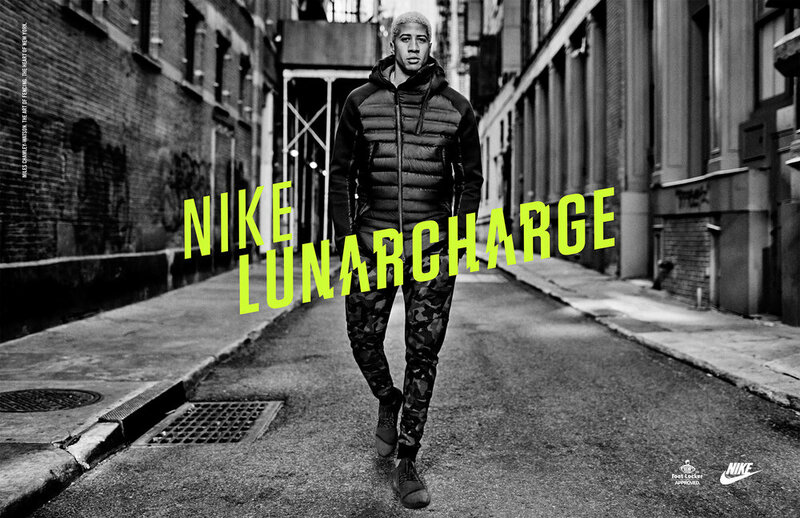 In early December 2016, the campaign continued with an out-of-home extension for the launch of Lunarcharge. A stylish and comfortable shoe built for the city. Centering around some of the city’s most celebrated influencers including London Zhiloh, Nigel Sylvester, Miles Chamley-Watsony, and Mr. Flawless, this gritty and raw campaign extension showcased each celeb in various authentic settings around their city. I worked with the North America Brand Design team to promote key product drops combined with athlete and consumer moments which came to life through posters, digital billboards, retail design and exclusive events at select Footlocker doors. It was shared across social channels in tandem with the Nike East #NewYorkMade campaign.